Join The Pranksters, live in New York City, performing at the storied Rockwood Music Hall with their groovy, signature vibe of hip-hop, blues & rock! This is sure to be an acid test you won't want to miss! Doors open at 5pm. Traditional St. Patrick's Day dinner will be served! This Show is FREE to enter with a ticket. This show is 21+. ID will be required. This show is being recorded. By entering the venue you agree to be filmed. Join us Wednesday, Feb 20th for a wild and diverse hip-hop lineup at The Stanhope House as we open for rap duo "The Palmer Squares"! Tickets are available now! Catch us at The Stanhope House with our homies The City Limit for another awesome benefit show to support the Randolph Regional Animal Shelter. The Pranksters performing live at Garwood's New Orleans-inspired lounge, Crossroads. The Pranksters performing live at Clifton’s own Clash Bar on Friday, June 15th with special guests! Foster & The Pranksters + Jay Mickens + More! Live at Teaneck, NJ’s #1 live music venue, Debonair Music Hall! Foster & The Pranksters performing live at Asbury Park’s infamous “The Saint” on Tuesday, June 5th with special guests Evangelia and Noelle. Catch The Pranksters live at underground staple, The Meatlocker in Montclair, NJ on Thursday, March 22nd. 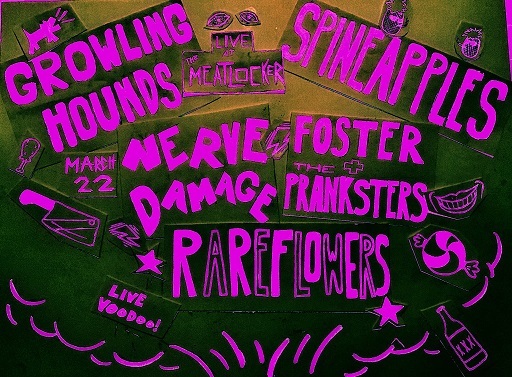 Joined by a stacked bill, including: The Growling Hounds, Spineapples, Nerve Damage & The Rareflowers, you don't want to miss this show!